For many police officers, a patrol car is their office. They're constantly on the move, racing from call to call. "It's one of the most critical areas because we spend so much time driving," said Cpl. Scott Wheat, an instructor at Montgomery County's Public Safety Training Academy. 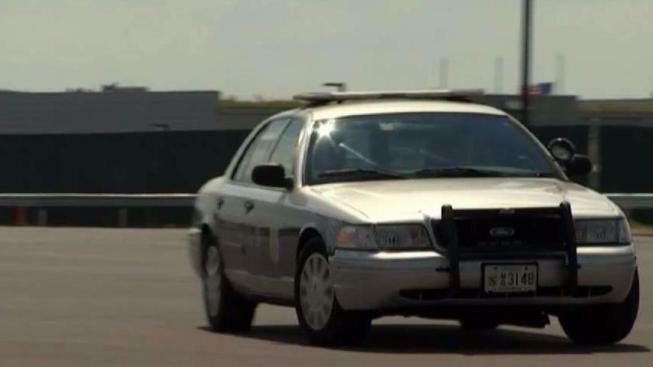 But less than a year after the state-of-the-art academy opened, the News4 I-Team found the $100 million facility to train public safety workers had to close its driving track, and another driver training area doesn't work the way it should. The repairs, which will begin this week, are slated to cost about $500,000. Wheat showed News4 the driving track, which cost more than $1 million to build. It opened late last year, but officers stopped using it shortly thereafter. "That was immediately recognized as this could potentially be very hazardous to the recruits," said Wheat. When officers started driving it, they noticed a small hill toward the back curve of the track where they actually lose sight of the road on the other side. Wheat said it could be good advanced training for veteran officers, but rookies who don't have driving experience could lose control. "We have a potential for going up on that berm," he said. Some areas of the track have guardrails, but officers think more are needed, especially around several light poles, which can also be a hazard. "Most officers who've been killed in the line of duty have been killed in vehicle collisions," said Assistant Chief Luther Reynolds, adding that practicing dangerous situations prepares officers in case those happen for real. For example a skidding maneuver, which teaches officers how to regain control. The training area used for that maneuver is called a skid pad. But at the new academy, you can't skid on it. Right before construction, Montgomery County leaders realized their environmental protection department had banned the pavement sealant slated to be put on top. Now, it'll cost another $440,000 to install a slick polished concrete center instead. "And we'll be able to use this in limited ways, but until that concrete gets put in place, we can't use it as a skid pan yet," said Reynolds. "Absolutely that will fix it," said Montgomery County General Services Director David Dise, adding that the county actually came up with that fix before construction but then scrapped the idea to save money. "Now that we know we need to, it's not outside the scope of the project, but it was certainly a cost we didn't want to spend if we didn't have to," Dise said. He said county projects always build in an extra 10 percent of the cost for contingency, so the improvements won't make the price any higher than what was already budgeted. While the contractor is still out there doing storm water work, the county will also install guardrails in three additional locations along the driving track, and widen the shoulders. "To give us that margin for error," said Wheat. "To allow the recruits to make a mistake without potentially hurting them or tearing up equipment." But those recruits, who use the training track the most, will just have to be extra careful on that hill. "The issue of adjusting elevation on an existing road are quite challenging and expensive," said Dise, explaining that the county won't be improving that area right away. Dise wants officers to use both features for a little while and see what else needs to be done. He told the News4 I-Team that if the hill becomes a serious problem in the future, the county will look at fixing it down the road. In the meantime, the officers have been using the state training track in Sykesville, so they don't miss out on building those skills. The initial improvements to the driving track and skid pan should be finished by early next year. "We're actually OK to be in this place because we want to get this right," said Reynolds. "We're excited." Reported by Jodie Fleischer, produced by Rick Yarborough, and shot and edited by Steve Jones.